Exporter of PP Solid Ball Valves in India. We are the top PP ball valve manufacturer across the India. 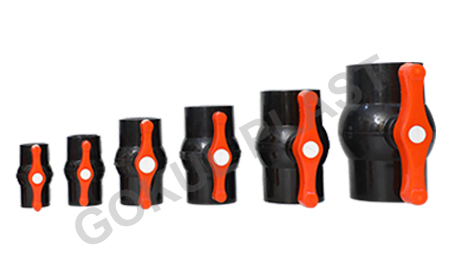 This PP solid ball valve is largely useful for the industrial and agriculture purpose. We are using a quality tested raw materials for to manufacture the standard types of solid ball valves. Our valves are fabricated in compliance with the international quality standards and are tested on diverse parameters to guarantee their smooth functioning and consistency. Our experts work in close equilibrium with each other to achieve the goals of the organization in an efficient and effective manner. In all form our product is prepared by the pp union type ball valve. Our provided valve is manufactured by our skilled professionals by using quality approved raw material and latest techniques. At an every stage the products are supervised by specialists. Best Quality, Competitive Rate, & Prompt Service are the motto of the company. We have a wide network spread across India which provides full customer support. This valve is widely used for controlling flow of liquid in desired direction. Moreover, our clients can avail this valve from us at reasonable price.